Maultaschen is a big fat German version of ravioli. 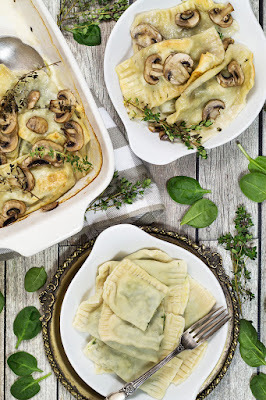 These dumplings are usually stuffed with meat and spinach mixture but I also made a vegetarian filling consisting of mashed potatoes, spinach, and topped with cream and mushrooms! Either in a bowl or in a mixer, combine all the dough ingredients. Knead for about 10 minutes by hand or keep mixing in a mixer until you get a tight dough ball. Remove the dough from the bowl and wrap in plastic wrap. Let sit at room temperature for at least 30 minutes. Meanwhile, prepare the fillings. For the meat-spinach filling, mix the spinach, cooked meat, and grated onion in a bowl. Soak the bread slices in water or milk, squeeze, and crumble into the meat-spinach mixture. Season with salt, pepper, and nutmeg to taste. Add the eggs and mix until well blended. For the spinach-potato filling, boil the unpeeled potatoes for 25-30 minutes until done. Let cool until they can be handled and peel them. Pass the warm potatoes through a ricer or simply mash with a potato mashed until smooth. Let cool. In a saucepan, melt the butter and add the onion, garlic, and 1 teaspoon salt. Cook, stirring, for about 4-5 minutes, until the onion is translucent. Add the spinach and cook, stirring, for about 3 minutes, until wilted. Remove from heat and add the spinach mixture to the potato mixture. Mix well and set aside. Take the dough and cut it into portions. Lightly flour a work surface and roll each portion into a thin sheet. Cut each sheet into 3-inch (8 cm) squares. Put a heaping teaspoon of filling in the center of each square, moisten edges with the egg yolk mixed with water, and fold in half to form pockets. Press edges together firmly and crimp with a fork. For the spinach-meat filling, boil the dumplings in salted water for about 10 minutes. Serve in chicken or beef broth or simply topped with some yogurt. For the spinach-potato filling, preheat the oven to 350°F (180°C). Boil the dumplings in salted water for about 6-7 minutes. When done, transfer with a slotted spoon to a baking dish. Top with the sliced mushrooms and pour the cream evenly over the top. Arrange the thyme sprigs evenly around the dumplings and bake for about 20 minutes, until the mushrooms start to brown. Enjoy! The amount of dough is measured for one of the fillings. If you want to make both of them, double the ingredients of the dough. 0 Response to "MAULTASCHEN – GERMAN STUFFED PASTA (TWO FILLINGS)"